Despite a referendum in February having passed that he cannot run for another term as president, current Bolivian President Evo Morales will run for a fourth term. Despite the Bolivian Constitution itself stating that he cannot run for another term, Evo Morales will run for a fourth term. Despite the fact that he has been treated in Cuba for an illness, he will run for a fourth term. It seems that Evo Morales does not want to give up the power of the presidency. Morales has stated that he will change the constitution to stay in power indefinitely. It seems that he will do whatever it takes, despite the law and the growing unpopularity of his rule, to remain in office. He is following in the steps of his protege former Venezuelan President Hugo Chavez that he will not give up power til death takes him. This is the definition of a dictator. He does not care about the law of his own country, nor about the will of the people. He will do whatever it takes to keep full power. More than that, he is establishing a cult of personality where he is trying to portray himself as the “liberator” of Bolivia. Case in point is the newly built Museum of the Democratic and Cultural Revolution (shades of the Chinese Cultural Revolution!). It is a left wing view of the history of Bolivia, but worst of all it is a dedication to Evo Morales. The museum itself cost US $7.1 million to build, and it was built in the Village of Orinoco—a place with only 900 people and with a poverty rate of 90 percent. Wouldn’t that money have been better spent helping the people of the village and region? Evo Morales may have been the first elected indigenous Bolivian to the office of the presidency, but now he is doing his own country a major disservice by staying in it for life. Worse, the rule of law, or whatever Bolivia had of it, is rapidly deteriorating under him. His current term ends in 2020, but he is running again for president in 2019. 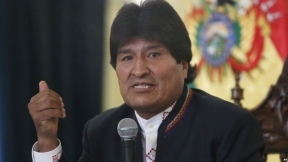 I hope that most of the Bolivian people will send a clear message that they do not want Evo Morales to be president anymore in the next election. And if they do cast their vote to get rid of him, will he heed the advice of the people and go?